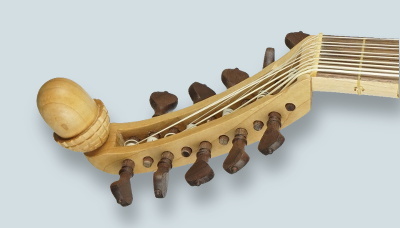 The gittern was a common medieval instrument. It originated some time in the 13th century, and had largely died out by the end of the 15th century. 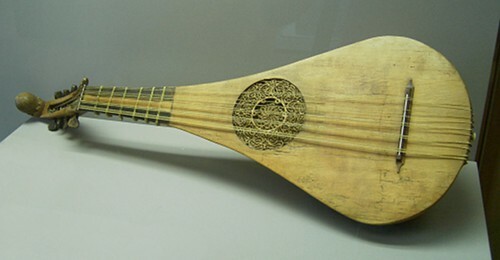 It resembles a small lute, but its body is carved from the solid. My gitterns are based on a surviving example in the Wartburg museum, by Hans Oth of Nuremberg, dated circa 1450. It is one of my most popular instruments. Few other luthiers are crazy enough to make dugout instruments. The Oth gittern has a string length of 445mm. It has 5 double-strung courses. 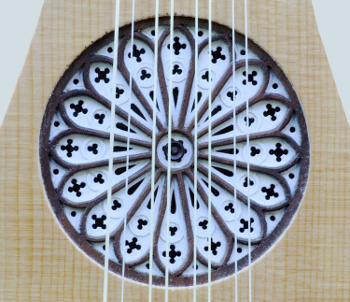 There is some evidence on historical gittern tuning. For an in-depth account, see Ian Pittaway's gittern article. I also make a 4-course version, which has proved popular. It is more typical of slightly earlier gitterns. The evidence suggests that 4-course gitterns were tuned in fourths. Carved head (replaces acorn) From £150, depending on complexity.